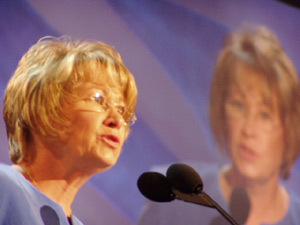 St. Paul, Minn. — (AP) Child safety advocate Patty Wetterling, who ran for Congress last year, is shifting her 2006 campaign focus to a possible Senate bid. Wetterling, a Democrat, issued a news release Friday saying she will form an exploratory committee in coming weeks to look at a campaign for the Senate seat being vacated by Democratic Sen. Mark Dayton. "After discussing this development with family, friends and supporters I have decided to actively explore a run for the U.S. Senate," Wetterling said in the statement. Wetterling wouldn't comment beyond the statement, spokesman John Schadl said. And, Schadl said, she hasn't ruled out another campaign for the 6th District Congressional seat, which Rep. Mark Kennedy is giving up to run for the Republican Senate nomination. Wetterling, of St. Joseph, lost to Kennedy by 30,000 votes last November in her first political campaign. She gained prominence in the years following the 1989 abduction of her son, Jacob, and her ensuing efforts to prevent similar tragedies. Other Democrats mulling a Senate campaign are Hennepin County Attorney Amy Klobuchar, Minneapolis attorney Mike Ciresi, U.S. Rep. Betty McCollum, University of Minnesota general counsel Mark Rotenberg, state Rep. Tom Rukavina, former state Sen. Jerry Janezich. Republican candidates include Kennedy and former U.S. Sen. Rod Grams. U.S. Rep. Gil Gutknecht is also giving a statewide campaign some thought.